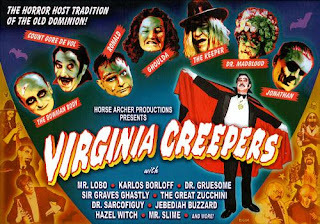 Documentary filmmaker Sean Kotz, friend of the Farm and director of both Virginia Creepers: The Horror Host Tradition Of The Old Dominion and "Hi There Horror Movie Fans! ": The Bowman Body Documentary succeeded in rebooting the Official Site of The Bowman Body as of November 17. You can check it out here. Both documentaries are available at the site's store, as well as t-shirts and other fine merchandise. Maybe we could convince Mr. Kotz to make an appearance at our next Movies At Dog Farm event. . . It's not the Byrd Theater in Richmond, but old codgers like Phil Neff and myself would have a blast. I could even try to persuade fellow employee Tom Blalock (who played the Mummy alongside the Bowman Body) to join us, too. The Pit is slated to release in January, 2013. Actress/model Mel Carver has also been busy. You can check out her new Facebook page here, her official website here, and pre-order her latest movie The Pit here. If you pre-order the movie you get a free poster, so be sure to specify that you want one of the two posters featuring Mel. The one she has displayed on her Facebook page is awesome! You can also help the producers of Mel's upcoming project Predatory Moon raise funds and spread awareness. Click here to find out more.